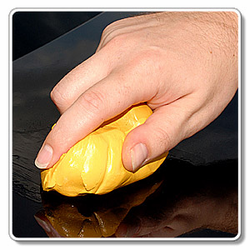 A car clay bar is an essential car detailing tool that targets the common enemy of every car finish: pollution that causes automotive paint contamination. It relentlessly pursues your car from the second it leaves the factory until your car meets its ultimate demise. It's in the air we breathe, it's on the roads we drive, and it attaches to your car's paint, where it bonds and begins a process of oxidation. Surface contamination, as shown by this diagram, is difficult to clean or polish off, yet paint cleaning clay removes it with ease. When contaminants get a solid grip on your car's paint, washing alone may not be enough to remove them. Pre-wax cleaners also may not be able to exfoliate large particles. In this case, you have two choices: use a polishing compound, which removes a lot of paint material, or use a clay bar. A clay bar isn't a polish or a compound, it is a surface preparation bar that smoothes the paint and exfoliates contaminants. Clay is not a cure-all or a replacement for polishing. It's a tool for quickly and easily removing surface contamination. One of the many reasons for using a clay bar is the removal of brake dust. Brake dust contamination, which attaches to painted rear bumpers and adjoining surfaces, is a metallic surface contaminant that can be removed safely and effectively by using clay. Clay is also very effective on paint over-spray. If the over-spray is particularly heavy, you may want to seek the assistance of a professional. Tree sap and tar specks can also be safely removed with a clay bar. A heavier grade clay bar, like McKee's 37 Universal Detailing Clay, may be more suitable for heavy overspray. Recently, I have also started using clay on my windows (exterior) to remove heavy road film, bug deposits and water spots. It works very well, and seems to outperform even the best window cleaners. HOW DOES DETAILING CLAY WORK? Clay removes above-surface bonded contamination through the mechanical action of the clay bar rubbing against the vehicle surface. Detailing clay abrades the contamination, wearing it down in some cases, as a result of this mechanical action. However, detailing clay is not abrasive to the paint. The use of an approved clay lubricant prevents marring of the paint. The removed contamination sticks to the clay and is removed from the paint. Detailing clay formulation determines the optimal function of the clay and its potential to do damage when used improperly. As an example, a professional grade clay bar that�s designed to remove paint overspray is very firm and contains abrasives equivalent to heavy rubbing compound. Used properly it will remove heavy overspray without damaging the paint. Used improperly, it can leave some pretty significant surface marring. That�s why it�s a professional product. Most consumer grade detailing clays are designed to be used as an annual or semi-annual paint maintenance tool prior to polishing and waxing. At this frequency, these detailing clay products work great. Simply use the clay as part of your major detailing regimen. The problem we were beginning to see is that many car enthusiasts wanted to clay their vehicles frequently; as often as monthly. At this rate of use, some consumer grade detailing clay can begin to dull clear coat finishes. After all, it is an abrasive! BLACKFIRE Poly Clay and Pinnacle Ultra Poly Clay are both so fine that they are safe to use monthly to keep paint smooth and clean. The clay easily removes the dirt and makes the paint finish feel super slick. The Cobra Clay Mitt is the easy way to remove embedded contaminants from your vehicle. Featuring a high-tech rubberized coating on one side, this wash mitt gently removes below surface contamination while you wash! The Cobra Clay Mitt is much easier to use than traditional clay since it never requires re-kneading, and if you drop it, simply rinse it off and keep using it�try that with a traditional clay bar! The Cobra Clay Mitt is easy to use and utilizes the lubrication in your wash solution to glide across paint without damaging it. While traditional clay bars require constant re-kneading and need to be tossed if they hit the ground, the Cobra Clay Mitt requires only a rinse to remove any dirt or grime, making it an excellent value! The Cobra Clay Mitt strong enough to remove tough contaminants, yet gentle enough to do so without causing marring or scratching. The mitt design slips easily onto your hand and stays put throughout the washing process. The Cobra Clay Mitt simplifies the way you decontaminate paint! Cobra Clay Mitt is a detail clay bar alternative that lasts longer than detail clay and eliminates clay limitations. A single Cobra Clay Mitt will clean over twenty cars! You can use the Cobra Clay Mitt with a Clay Lubricant or using your shampoo mixture for washing the car. At Autopia Car Care, we're fanatics about smooth, clean, glossy paint. With the advent of BLACKFIRE Poly Clay, Pinnacle Ultra Poly Clay and the Cobra Clay Mitt, you can now clean your paint regularly without concern for reducing clearcoat thickness or scratching. It's the perfect solution for crystal clear, super smooth paint.